Every bodybuilder has a signature body part. 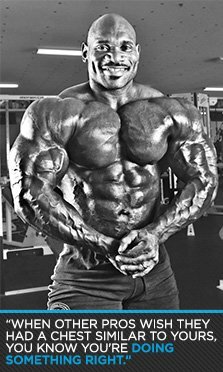 Fred Smalls gives us the secrets to how he built his famous chest. Try his ''Biggie Chest'' workout! Whether you're a competitive bodybuilder or just starting out, your main goal is probably that complete physique. Yet all the greats have signature body parts. Ronnie Coleman was best known for his huge back, Dexter Jackson's secret weapon is his incredible midsection, and Branch Warren's nickname is Quadrasaurus. I could go on and on. The body part I am most known for is my chest. When other pros wish they had a chest similar to yours, you know you're doing something right. But I can promise you this: Rome wasn't built in a day and neither was my chest. It wasn't built with cable crossovers and machines, either. My pecs were built with barbells and dumbbells, high-volume workouts using heavy weights. Perform this routine for three weeks and watch the results come. Your chest will be fuller, thicker, and stronger. Note: Rest for 60 seconds between sets. Many champions of the Golden Era considered the bench press their upper-body mainstay. I like to do 7 sets of 7 reps. Choose a weight 60 percent or so of your max and stick with that for all 7 sets. This will fatigue both your fast- and slow-twitch muscle fibers. But because of the short rest and lighter resistance, you won't place as much stress on the tendons and ligaments of the shoulder and increase your chances of injuries. You get the best of both worlds. If you're like me, you don't just want to look strong—you want to be strong. That is why I like using a rep range of 6-8. After seven sets of flat bench, you shouldn't need much weight for inclines. Focus on contracting the pecs and the strength will come alongside those thick and dense muscles you're after. By using dumbbells, we increase the range of motion and keep the muscle engaged for longer periods of time. The dumbbells also force each side of your body to work independently and together, which puts more demand on your muscles. To hit your pecs and get as much nutrient-rich blood into the muscles as possible, lean forward. This position will engage your pecs more than your triceps. To keep constant tension on the chest, don't lock out your arms at the top of the movement. This exercise is unique because your muscles are stressed for a full 30-40 seconds. Keeping your muscles under tension for so long ensures that you completely exhaust your ATP glycolic system. This will force your body to call on the lactic acid threshold system and create a greater release of growth hormone. Do these slowly so you can enjoy all the benefits this exercise has to offer. The goal is 50 reps and it doesn't matter how many sets it takes—just make sure you get 50 total before getting up. Try doing it in 3 or 4 sets.